The original small-format digital oscillator returns in a completely new hardware design. Hertz Donut Mk II is an entire re-imagining of the concept, with significant improvements in every way. A new 16-bit digital audio system delivers high-frequency performance, and the user interface provides direct access to all operational modes with a minimum of button presses. 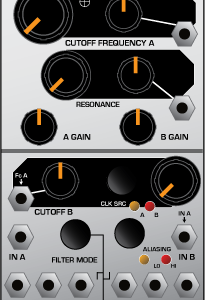 Hertz Donut features two independently functioning digital oscillators with wide frequency ranges. 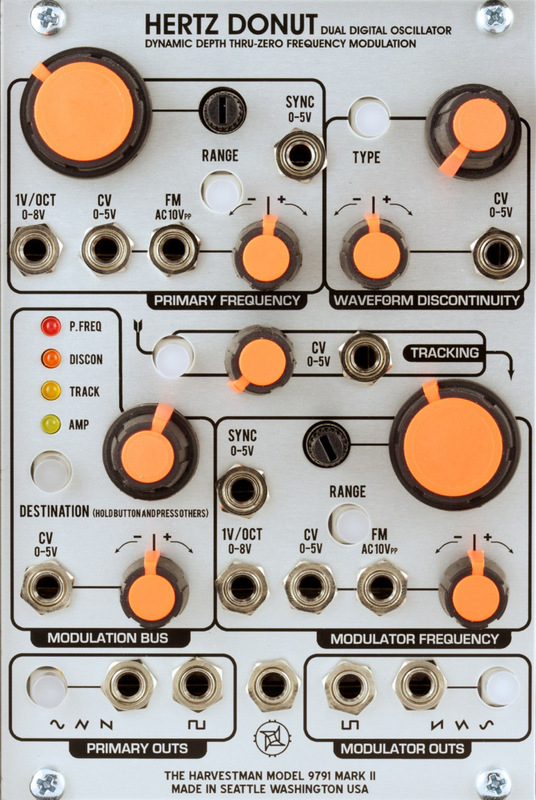 An internal bus enables full-bandwidth, high-index modulation of oscillator frequency, wavefolder drive, tracking phase, and amplitude, with the modulation signal appropriately conditioned for each destination. 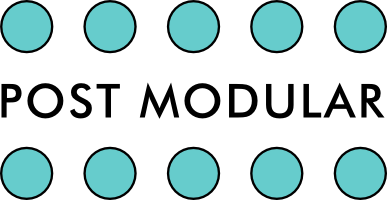 Nearly all voltage control nodes feature “attenuverters” for bipolar modulation of the main parameters by an external voltage. Internal and external frequency modulation is thru-zero. The wavefolder has three modes depicted by the color of led on the selector button. The “orange” mode is the xor-based “fractal” waveshaper known from the original hertz donut, improved. The “red” and “green” modes are traditional dynamic-drive nonlinear lookup tables, selected for their wide range of available tones. The oscillator outputs sine, triangle, and sawtooth waves, each offering distinct behavior when routed through each of the wavefolders. 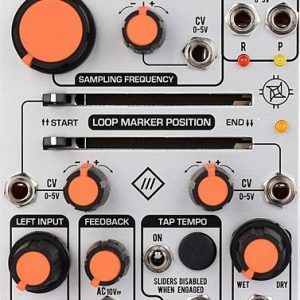 The tracking controller “closes the loop” by instructing the modulating oscillator to follow the frequency of the primary. 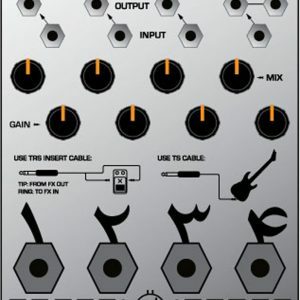 Two modes accomplish this quickly, with optional offset from the base frequency. Phase modulation of the waveform is possible, whether manual, under voltage control, or through the internal audio-rate modulation bus. A third tracking mode introduces delay and wandering behavior to the tracking, with the time constant under user control. 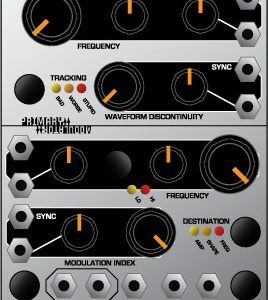 Circular modulation in these modes is the key to the most bizarre, unrepeatable sounds this module is capable of generating.